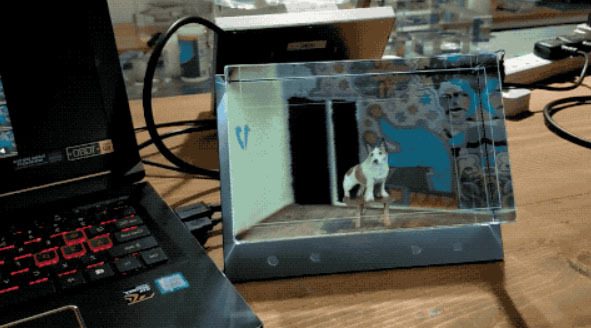 The Looking Glass is the first universal desktop holographic display designed for 3D creators. The display generates 45 simultaneous views of a 3D world at 60 fps. It does not require a VR headset. Headsets have come a long way from the Google Cardboard, but even so they are still an impediment that must be worn or held. The company is called The Looking Glass Factory. It is headquartered in Greenpoint, Brooklyn, the home of the hologram. Their factory is in Hong Kong where they are assembling the first hundred Looking Glass units right now. It will come with a library of free apps. Shipping to begin December, 2018. Prices to start at $499. The company has created a streaming video channel designed specifically for the Looking Glass. When it is released, you can open the Vimeo app on your Looking Glass and then enjoy curated holographic content. You will be able to interact with 3D scenes without using VR/AR headgear.